Western blot analysis of extracts from HeLa and COS-7 cells using p38 MAPK (D13E1) XP® Rabbit mAb (HRP Conjugate). Supplied in 136 mM NaCl, 2.6 mM KCl, 12 mM sodium phosphate (pH 7.4) dibasic, 2 mg/ml BSA, and 50% glycerol. Store at –20°C. Do not aliquot the antibodies. 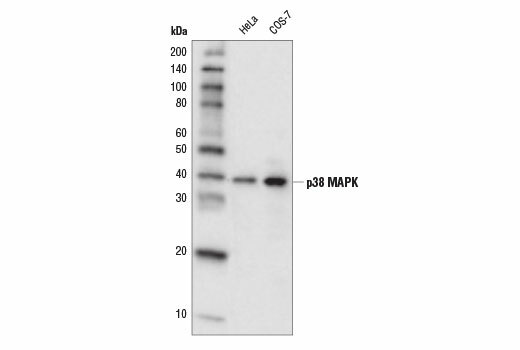 p38 MAPK (D13E1) XP® Rabbit mAb (HRP Conjugate) recognizes endogenous levels of total p38α, β, or γ MAPK protein. This antibody does not recognize p38δ, SAPK/JNK, or p44/42 MAPK proteins. Monoclonal antibody is produced by immunizing animals with a synthetic peptide corresponding to residues near the carboxy terminus of human p38 protein. p38 MAP kinase (MAPK), also called RK (1) or CSBP (2), is the mammalian orthologue of the yeast HOG kinase that participates in a signaling cascade controlling cellular responses to cytokines and stress (1-4). Four isoforms of p38 MAPK, p38α, β, γ (also known as Erk6 or SAPK3), and δ (also known as SAPK4) have been identified. Similar to the SAPK/JNK pathway, p38 MAPK is activated by a variety of cellular stresses including osmotic shock, inflammatory cytokines, lipopolysaccharide (LPS), UV light, and growth factors (1-5). MKK3, MKK6, and SEK activate p38 MAPK by phosphorylation at Thr180 and Tyr182. Activated p38 MAPK has been shown to phosphorylate and activate MAPKAP kinase 2 (3) and to phosphorylate the transcription factors ATF-2 (5), Max (6), and MEF2 (5-8). SB203580 (4-(4-fluorophenyl)-2-(4-methylsulfinylphenyl)-5-(4-pyridyl)-imidazole) is a selective inhibitor of p38 MAPK. This compound inhibits the activation of MAPKAPK-2 by p38 MAPK and subsequent phosphorylation of HSP27 (9). SB203580 inhibits p38 MAPK catalytic activity by binding to the ATP-binding pocket, but does not inhibit phosphorylation of p38 MAPK by upstream kinases (10). Rouse, J. et al. (1994) Cell 78, 1027-1037. Han, J. et al. (1994) Science 265, 808-11. Lee, J.C. et al. (1994) Nature 372, 739-46. Freshney, N.W. et al. (1994) Cell 78, 1039-49. Raingeaud, J. et al. (1995) J Biol Chem 270, 7420-6. Zervos, A.S. et al. (1995) Proc Natl Acad Sci U S A 92, 10531-4. Zhao, M. et al. (1999) Mol Cell Biol 19, 21-30. Yang, S.H. et al. (1999) Mol Cell Biol 19, 4028-38. Cuenda, A. et al. (1995) FEBS Lett 364, 229-33. Kumar, S. et al. (1999) Biochem Biophys Res Commun 263, 825-31.